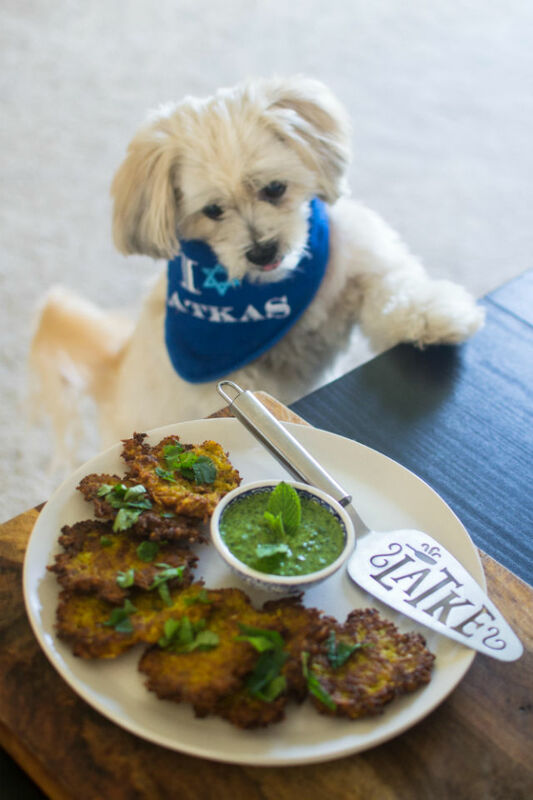 Hanukkah with an Indian twist. Growing up my mom always made the best latkes. And while I know everyone probably says this about their mom, I maintain: Her latkes really were the best. She would stand over the sink shredding and shredding potatoes until nights end. Then she would insist on squeezing as much water out of the vegetables as possible. And when she thought they were dry, she would squeeze some more. A labor of love, for sure. Though I get inspired from my mother’s method, I have updated my own latke recipes and techniques with some modern twists. Instead of standing of the sink shredding potatoes till sunlight, my hefty powerhouse food processor does all the work for me. My mom was shocked when I told her I don’t grate them by hand anymore, and I still hear stories of her battle wounds to prove her latke love. One of the most important tricks for successful latke frying is about prepping! Frying latkes is a messy job and you don’t want to walk away from hot oil, but instead be in control of it. I always like to have a cookie sheet ready with a cooling rack and then 2 layers of paper towels. That way I can transfer the latkes directly from the pan to the cooling rack after they come out of the hot oil. And no overcrowding the pan – there should be no more than 3-4 latkes in the pan at one time. This ensures the temperature remains even and cooks up perfectly crispy latkes. For a fun modern twist, these Indian spiced cauliflower latkes are a spinoff of one of my favorite Indian dishes called Aloo Gobi. Potatoes and cauliflower are braised with spicy flavors of jalapeno, turmeric and curry. 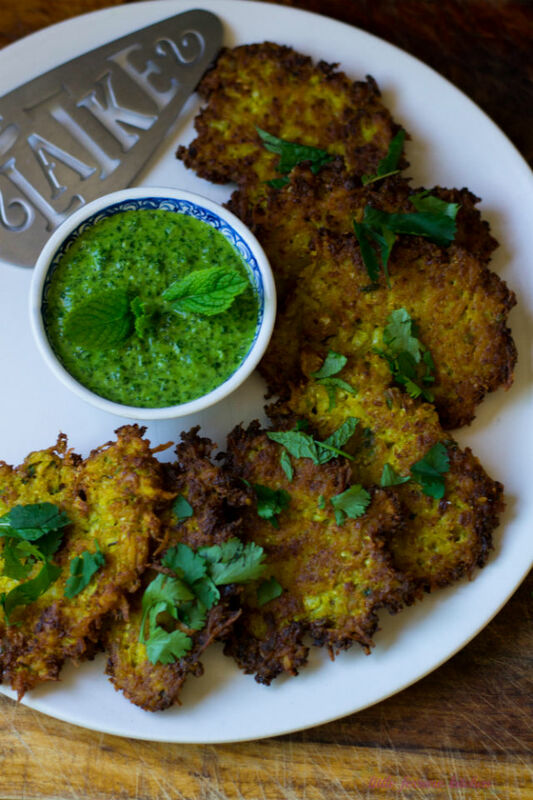 The sauce is a bright cilantro and mint chutney, also easily made in the food processor, and pairs perfectly with the crispy spiced latke. To make the latkes, first add the cauliflower florets in a food processor and pulse until they are fine and even pieces, then transfer to a large bowl. Add the small shred blade attachment to your food processor and shred the potatoes and onion, but do NOT add to the bowl yet. Place the onions and potatoes in a clean dish towel and wrap around potatoes, only a handful at a time. Then use your mighty strength and squeeze out as much moisture as you can. Then squeeze a little more. Once they are dry, add them to the cauliflower bowl. Repeat until all potatoes and onions are dry. Then add the rest of the spices, eggs, matzah meal, and green onion. Mix everything together until well incorporated. Heat a large skillet with about ½ inch oil to about 350 degrees F. I like to test the oil with a small piece of potato. If it sizzles, it’s ready. Use 2 tablespoons to form latke and place in hot oil. Then use the back of the spoon to gently flatten it out. Fry latkes for about 3-4 minutes until golden brown and turn over and finish frying for another 3 minutes. Remove latkes with a slotted spatula onto a paper towel-lined baking sheet and season with a sprinkle of salt if you’d like. To make the chutney, add all the chutney ingredients to a food processor and pulse until incorporated. Scrape it down after every few pulses. Pulse until desired consistency and until there are no large leaves left. 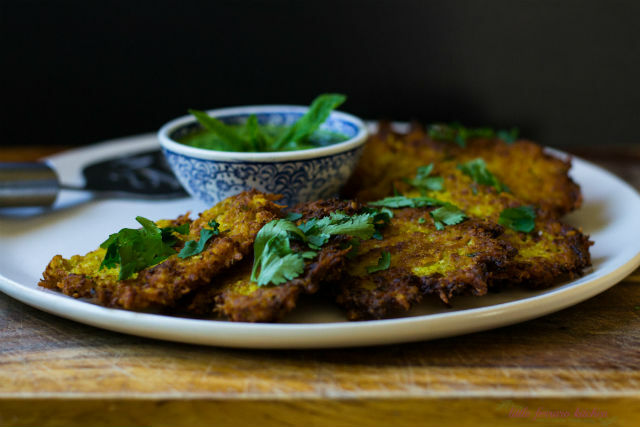 Serve latkes with chutney and garnish with fresh cilantro leaves. Plantain, cauliflower and and ramen are all viable substitutes for the tried-and-true spud.